I got really excited when I came upon my first American Bison or Buffalo in the Theodore Roosevelt National Park in North Dakota. It was around the next bend from the elk herd I talked about earlier this week. He was down in a ravine all by himself. If there where others with him, they kept out of view. Leaving the warmth of the car, I walked across the road to take some photographs and observe. This is when I first saw how the bison find their food in deep snow. He lifted his head to the right and, using his head as a plow, he moved it to the left while burying it into the snow. This exposed a wide swath of grass which he proceeded to munch on for several minutes before moving a bit forward and repeating the snow removal process. I watched him do this for awhile but the sub-zero temperatures won out and I returned to the car to continue my quest and warm my feet. Though I had found a buffalo, I wanted to see more. Now I knew what to look for in the snow. When a bison herd stops to graze, they clear off large areas. I could see many places where herds had been in the fields, hills and valleys I was passing. Yet, no animals. I was getting a bit discouraged as I was coming to the end of the park road which had turned from pavement to gravel. Part of the herd of Bison I photographed in the Theodore Roosevelt National Park in North Dakota. I was listening to the tires going over the mix of snow and stones when I came upon a herd of some twenty American Bison who has the duplicity scientific name of Bison bison. I slowly came to a stop and opened the passenger side window as they were off the right hand side of the road (while we Americans drive on the left side of our vehicles). Using my longest and heaviest lens, the Nikon 80-400 VR, I started photographing from the drivers seat. As they were about 100 yards (91 meters) away from me I was using the full 400mm setting on my 1.5x cropped Nikon D70 which amounts to 600mm on a full frame camera body. I began with earnest to photograph the herd and its individuals. This proved very uncomfortable as I kept stretching over to the passenger side over the car’s center console. I didn’t want to get out and make noise moving either. The herd of bison were very busy feeding themselves and I did not want to disturb such an important process. They had a long winter ahead of them and would need all the nourishment they could get. After a time, I figured they were not going anywhere and drove up and over the next hill out of their sight. I turned around and returned. Parking on the far left of the road in the opposite direction, I settled in to comfortably photograph the herd from the drivers seat for the next two hours. The largest of the males, this bull American Bison stayed at the bottom of the hill while I photographed his more adventuresome herdfolk. There were three large males keeping their distance from me. No doubt that is how they survive us tourists invading their home. The largest (pictured above) would have been a prized trophy back in Theodore Roosevelt’s time of the late 1800’s. Today, he is safe inside the park’s boundaries named after the former President of the United States who was also an avid hunter. Unlike the large males, the other males, females and young calves kept getting closer and closer to my location. 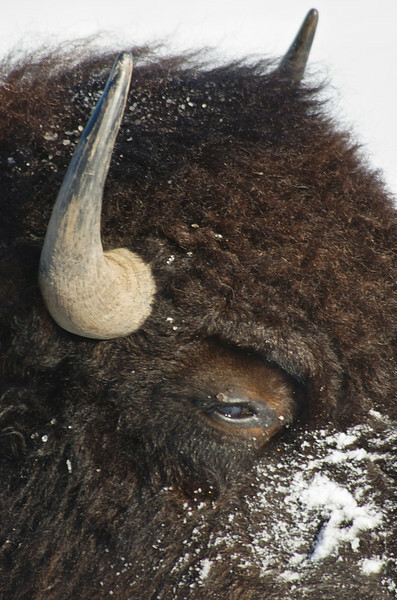 I changed from getting “look what I saw” type of photos to being able to compose photographs and portraits of the bison. At one time there were a half dozen individuals within ten feet of me. Zoom lenses are not as sharp as prime lenses, however, using one on this day proved very fortunate as I was able to zoom from 80 to 400mm and get lots of different photographs of the brown and shaggy beasts. A closeup of one of the Bison as they walked within ten feet of me. You can see the bovine eye and horns of this individual as well as her warm coat of hair. Though they looked peaceful, the bison kept an eye on me. Being a national park, I am sure they are used to cars stopping and people gawking at them. Some with equipment like mine. I was nothing new to them. I know they could hear my camera clicking as I could hear them breathing the cold air and eating the browse they continued to uncover. Their snow masked faces making it hard to see their eyes until they got near me. 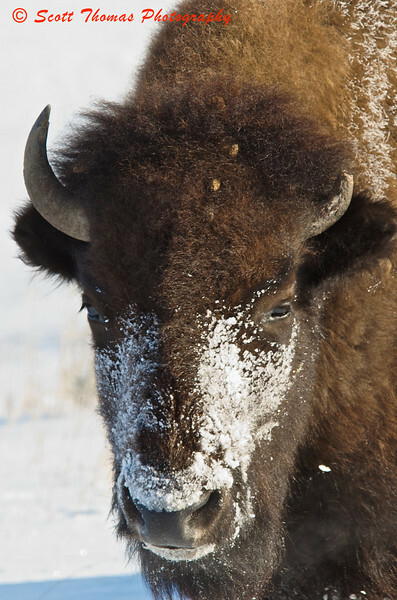 A cold portrait of an American Bison. The snow mask and condensed breath of this bison gives you some indication as to the cold weather which didn't seem to bother them at all. It was getting close to the time I needed to return to pick up my daughter from work, four of the bison (3 adults and a young calf) came up on the road in front of me and completely blocked it. I wondered if they wanted to keep me here and how was I going to get past them. The car I was in was no match for them if they decided to hold their ground. A passing Park Ranger truck showed me how by slowing down and never stopping, the bison gave way without a fuss. After a few more minutes, it was time for me to leave. I bid them goodbye and safe journey through a long winter knowing I had a long one of my own the next day. Photographing wildlife in their home from the smallest birds and insects to these large American Bison on a winter’s day brings to me excitement, wonder and hope. We share our precious planet Earth with billions of creatures who can not withstand humankind. However, a planet without them would be barren and sad to live in. 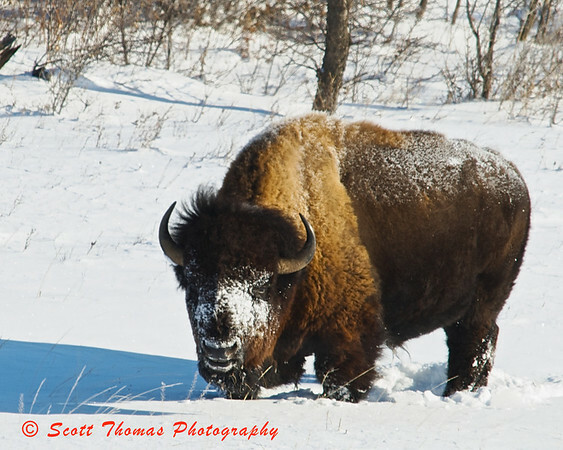 This entry was posted in Animals, Nature, Travel and tagged 80-400mm, american, bison, buffalo, cold, D70, herd, horns, naitonal park, nikon, north dakota, Photography, theodore roosevelt, vr, wildlife, winter. Bookmark the permalink. Wow, I’m really digging that panoramic shot of the bison. All of the shots are great, but I’m particularly keen on that one. Looks like it could be a painting. Nice work. The panoramic is a crop of a larger image. Not sure how big a print I could make of it. Thank you for your comment, Dave! I am in awe!!! Incredible experience and incredible photos!! Thanks for sharing them. When you and Merrie head out there this summer – it would be interesting to see them with a summer backdrop as well. They are massive and amazing creatures. How cool…. So glad everything went well with your journey from start to finish. You are a great dad. Thanks, Shel! I want to go back when it’s a bit warmer, too. That coat just looks so warm and deep. I’m glad there are places for the buffalo to graze in peace. Your observations about the “snowplowing” act were most interesting. Thanks for sharing your great day. The cold weather didn’t seem to bother them at all. While most of me was okay. My feet did get cold. You did an excellent job photographing them, Scott! I always enjoy seeing the Bison. We have the National Bison Range near here and I visit several times each year, never getting tired of it. Thanks, Terry! I need to work on processing the images better. The contrast from their dark color and the bright snow is a challenge. Scott – What an amazing day! My heart would just about leap out of my chest at such an experience. This is what I love about nature photography – that moment of inexplicable awe when you know you are witnessing and, hopefully, capturing something amazing. Great observation, great photos combined with a great narrative. Thanks for sharing! Thanks, Tracy! It was an amazing time with them. Glad you enjoyed the post! Sometimes you just can’t beat a zoom lens! Great photos, sounds like you had a great time. I had a wonderful time, Mike. For it’s age, the Nikon 80-400VR does very well. It’s a bit slow in focusing though. Rumor has it Nikon will be replacing it with a 100-500VR AFS lens this year. I will certainly be very interested if they do. Yes, the buffalo keep very warm. Though the air was very cold, the sun on those thick, dark hides probably made them feel very warm. Some were laying in the snow for most of the time I was there. Thank you for your comment, Nye! Thanks, Damien, for the pingback! Scott, I enjoyed the wonderful photos and your writing. Great post! Buffalo always captivates me and I always think of their history when I view a herd of buffalo. I agree as I feel the same as in excitement, wonder, and hope concerning wildlife. Yes, it would be very barren and sad to live on this planet without them.